This book is an extraordinary collaboration between Americans who were morally firm and unwavering concerning the rights of man, and enslaved people who were seeking freedom. It was called the Underground Railroad, which became the first great civil rights movement in the United States. It was led by Frederick Douglass, born of an enslaved black mother and a white plantation overseer father. Douglass worked with the abolitionist community that was largely white to bring freedom to the enslaved black population. 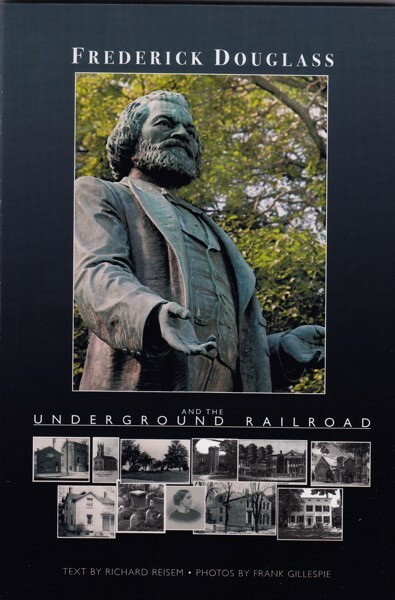 This book focuses on slavery in New York State and more specifically on Frederick Douglass and Underground Railroad activities in Rochester and Monroe County, New York. Douglass was a longtime resident of Rochester and is interred in Mount Hope Cemetery, famous for its many abolitionists and women’s rights advocates buried there. 93 pages. Written by Richard Reisem and photos by Frank Gillespie.